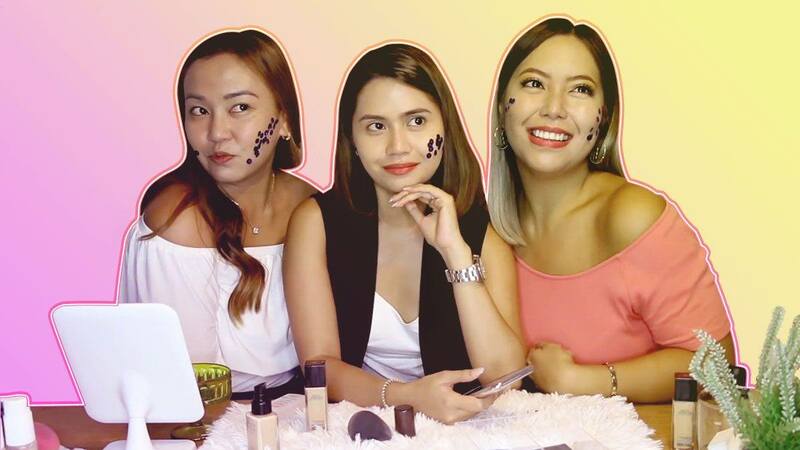 Will it pass the scrutiny of beauty vloggers Anna Cay, Anne Clutz, and Say Tioco? Most girls with oily skin probably feel like they never have enough oil sheets to blot the shine out of their face. And that sticky, oily feeling just gets worse when the foundation begins to cake and melt. Raise your hand if you can relate! Maybelline Fit Me Matte + Poreless Liquid Foundation could be the answer. This non-sticky, shine-free, and ultra-breathable makeup base is formulated with micro-powders to control your natural sheen and blur out your pores. At P399, could it be too good to be true? Check out what beauty bloggers Anna Cay, Anne Clutz, and Say Tioco had to say when they put this skin-perfecting matte base to the test (or three!). This involves sticking sequins onto your face to see if the matte foundation has a sticky finish. 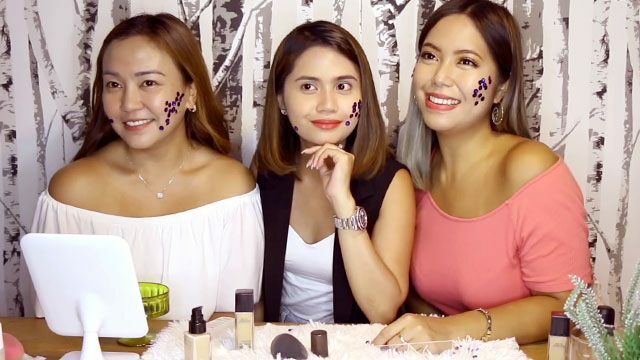 With the Fit Me foundation applied on the right side of Say's and Anna's faces, the photo below reveals that not many sequins stuck to the bloggers' faces due to the powdery finish of Maybelline's non-sticky liquid foundation. Say had this to say about Maybelline's Fit Me Foundation. "Sobrang love ko talaga yung Maybelline [Fit Me Foundation], kasi parang nag-powder [lang ako], at hindi siya icky." She rated the matte foundation a five out of five for its smooth finish and swatches. For their final test, Anne, Say, and Anna checked the oiliness of their skin with the foundation by sticking an oil film sheets onto their cheeks. They were surprised that the oil film didn't stick, which means the skin stayed dry and matte while wearing Maybelline's Fit Me Foundation. This ever-reliable swatch test lets you see the product's shade, texture, and pigmentation against your natural skin tone. It’s done on the arm to display the whole range of shades, then it's done on the jaw to see if the color matches the skin. 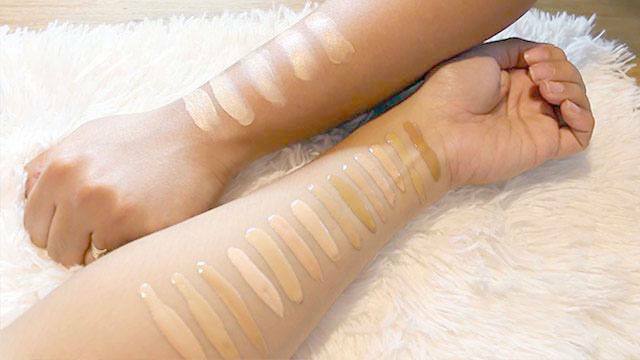 In Maybelline's swatch test, the convenience of having 14 shades made it easier for the bloggers to match the foundation to their Pinay skin tones—and it barely gave them enough swatching room on their forearms, too! After Anna applied the Maybelline Fit Me Matte Foundation, she noted, "'Pag nag-blend na siya, 'di mahahalata ang line of demarcation kasi well-blended and tama yung shade for you." With Maybelline's range of 14 shades, Anna easily got to match her foundation with her skin tone. View the full tests here, here, and here. 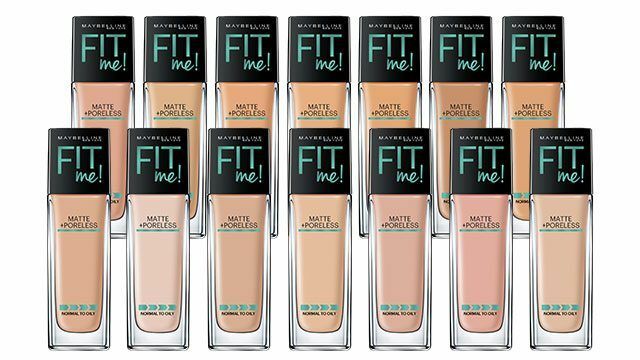 The Maybelline Fit Me Matte + Poreless Liquid Foundation is available in Lazada. To find out more about the product, check out the Maybelline website and follow them on Facebook.